With strong south westerlies predicted, Wheels on Wednesday cyclists made plans for an easy, one way ride. Melbourne is only around 75km from North Geelong. A secondary purpose of this ride was to view Ai Weiwei’s Forever Bicycle, an installation of 1500 bicycles in the foyer of the National Gallery of Victoria as part of the current exhibition. Nine cyclists left Rippleside Park soon after 8am. With a strong tail wind, Lara, and the Princes Freeway soon reached. A puncture stop near the Little River exit allowed for a short break. Luck was in – the two punctures happened simultaneously. As usual, there was quite a lot of glass and other debris on the road shoulder, but the surface, in general, is excellent. At Werribee, all cyclists must exit onto the Federation Trail, which follows the old open sewer viaduct from Werribee towards Spotswood. Our group rode the trail to the Old Melbourne Road in Footscray. This road has no bicycle lanes, but the left lane is quite wide. After a couple of km the group made a hook turn into Somerville Road, which has a dedicated bike lane. Somerville Road leads to a bike path soon joins the Footscray Road path which winds its way over Citylink, through Docklands and to Southern Cross Station via Collins Street. The whole ride took under four hours, including stops. 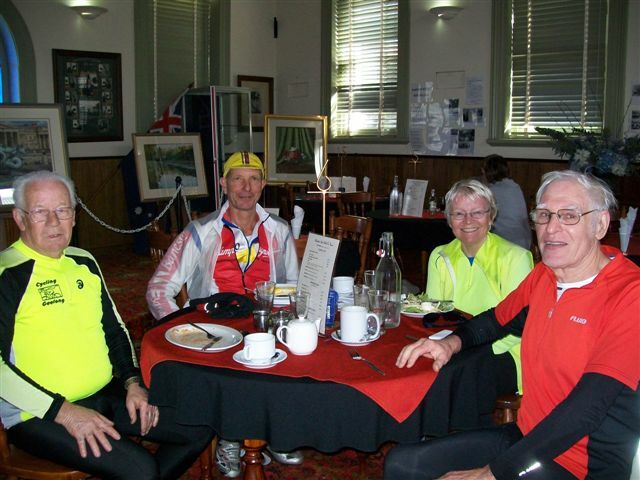 After a coffee/lunch stop, Allan, Russ, Ric, Jerry and Helen caught the 12:30 train back to Geelong, while Doug, George and Dave went to the gallery and John left to do business in the city. Trains back to Geelong around midday are generally quiet. Velocity trains include space for bikes in alternate carriages (look for the bicycle symbol on the door). While the whole ride was around 75km (longer factoring in people’s ride to Rippleside Park and home from the station), this is an easy ride, with no hills, and a good surface. As long as riders take care crossing entries and exits on the freeway, the highway option is safe. However, the ride can also be accomplished without riding on the highway, by taking back roads to Werribee. Wheels on Wednesday is open to all riders of reasonable fitness. Check the ride calendar for starting place and time. Simmering at the back of the mind is a plan to take the train to Colac, and repeat one of Allan’s favourite rides from Colac to Geelong. We’re waiting for a Wednesday with a strong westerly wind. This entry was posted in Best Rides, Ride reports by hlyth2013. Bookmark the permalink. I run websites for The Choral Grapevine (a regional newsletter for choirs in Western Victoria and South-Eastern South Australia) and Cycling Geelong (a recreational cycling group). I am an artist and photographer, musician and recreational cyclist.